1. What are Partial Views in ASP.NET MVC 5? 3. How to Create Partial Views in MVC? What are Partial Views in ASP.NET MVC 5? Partial View is a subpage of Main View page that keeps reusable parts of web pages. If your Main Page is too large then you can divide it into several pieces and store content into a partial page with a logical name. After that, you can call this partial page inside your main view page. Footer.cshtml: It may contain footers code. How to Create Partial View Page? Here, I am going to create several partial pages for my Layout page. 1. Open Visual Studio and Start a New ASP.NET MVC 5 Project. I have already created an MVC 5 project in the previous chapter, so I will use this for creating a partial view page. Now, I will break this page into several partial pages and then call that partial page into this layout page. 3. Right click on Shared Folder Add View. 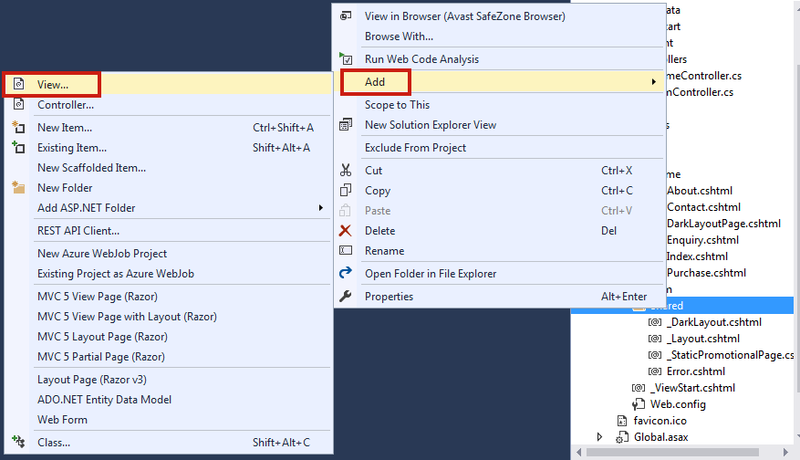 Create a view page Header and don’t forget to select checkbox Create as a partial view. Click Add button to Add Partial Page. 4. Now, find the following code in _Layout.cshtml and cut - paste it into Header.cshtml file. 5. Call this partial page inside the _Layout.cshtml page like this. It is very easy to create a partial page. 1. It is an effective way to breaking up large view pages into smaller components. 2. A partial page is reusable so keep common content in the partial page and used wherever you want. Partial View Page is very important and as a dot net developer, you will surely use it inside your project. 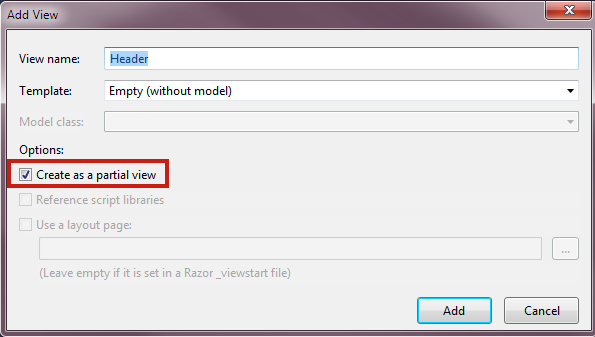 In the next chapter, you will learn very important topic: Razor View Engine.